You are at:Home»Reviews»Freelance Tools»Society6 Review – Sell your Creativity! Editor’s Intro: This Society6 review is a “must read” if you have a creative nature. It will introduce you to a place where you can turn your creative ideas into sellable items – with the tiniest of initial outlays. 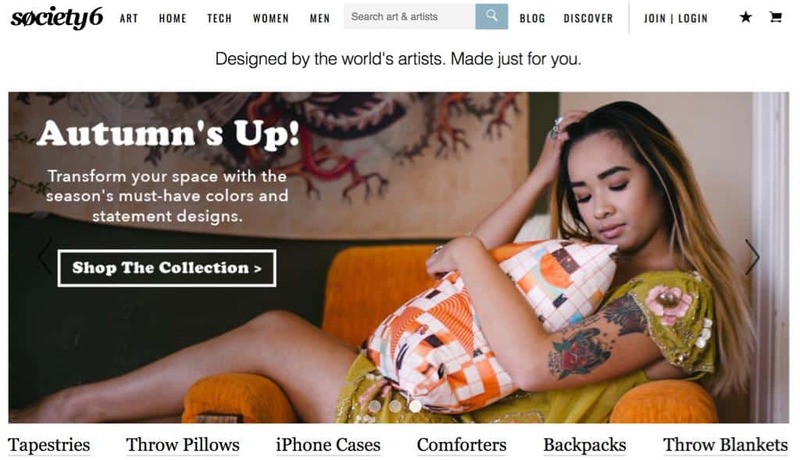 Society6 works on a “print on demand” model that’s become increasingly popular since this article was initially published. People “getting rich from selling T-shirts” is something we’re now hearing about in the mainstream media, so I thought I’d revisit this article and update it. Society6 isn’t the only place you can upload images and designs and setup a business selling T-shirts and merchandise. Other options include Zazzle and RedBubble, and even Amazon’s now got into the act with Amazon Merch. 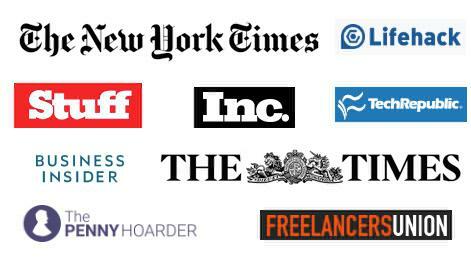 As well as feeling inspired by the thought of easily setting up a creative sideline, I’ve also ordered from these sites recently. There are some great designs out there – especially Christmas jumpers! Society6 Review: How does it work? A year ago, I uploaded some of my illustrations to Instagram and Facebook to share some laughs with friends. Little did I expect that I would be faced with requests for printed versions of my work. “This should be a shirt!” or “I must have a copy of this for my office!” were just some comments from my well-meaning but demanding friends. As an artist, I wasn’t too comfortable with this! I prefer to focus on creating, not hunting for suppliers and figuring out shipping fees (especially for friends spread out across the globe). This is why I signed up with Society6. It’s been over a year since I set up shop with them and I thought this Society6 review would be helpful and interesting for other work at home folks out there. 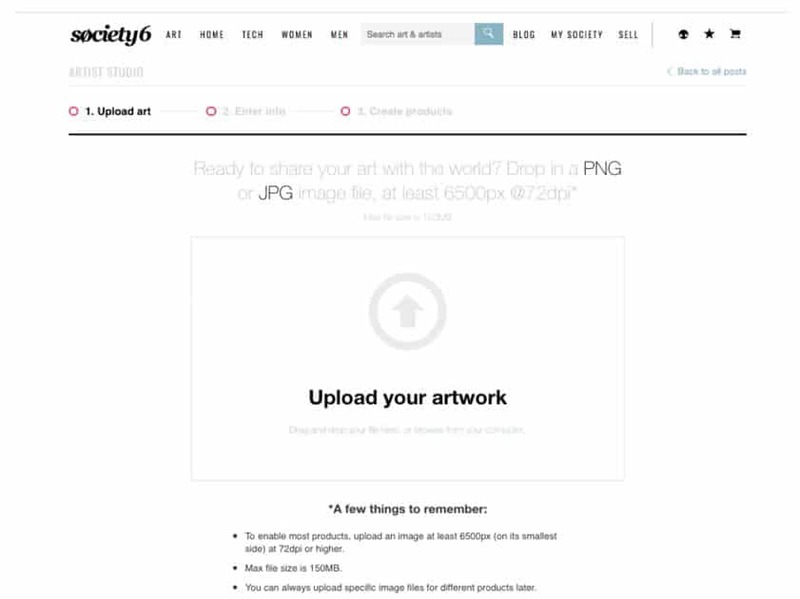 Society6 is a Print on Demand (POD) website. It’s a platform for artists, photographers, designers or writers to upload and sell their original works as consumer goods. An original work can be a drawing, a photo you took, or even a witty slogan you came up with that you think would look great on a shirt or a beach towel. The beauty of this platform is that it’s not limited to one craft. There’s even an artist who takes photos of her origami and uses those images. 1. Setting up shop costs only $1! 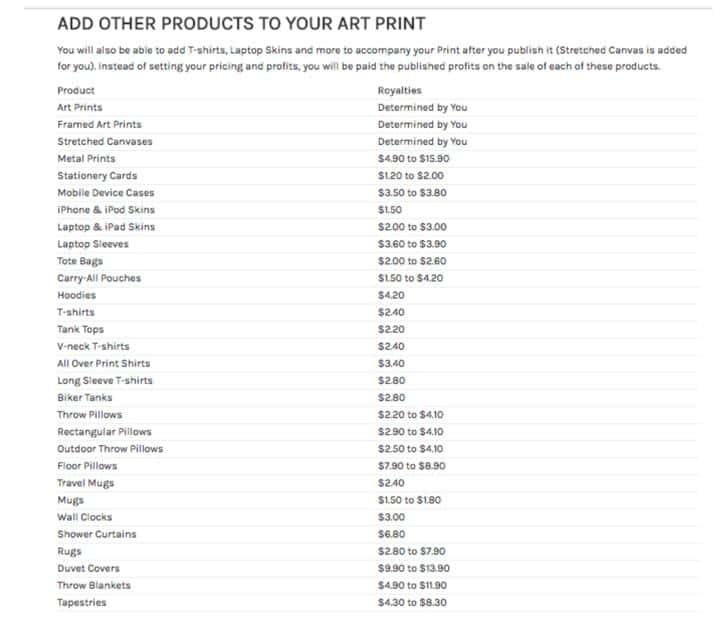 Compare this to Printful where you have to create your own online shop—meaning you pay for your own domain, hosting and e-commerce platform (if you use Shopify or BigCommerce)—before you connect it to their platform. 2. The range and quality of products – after a quick review of Society6 products, I compared them with other sites. I found that they had a greater variety of items from tech accessories to home decor. As for quality, their clothing products are American Apparel, whereas other sites asked you to pay extra to upgrade to this brand. 3. Their image. (Full disclosure, I just thought it was cooler.) Maybe it was the minimalist interface or the branding but it just spoke to me. In short – Society6 works like a dream! 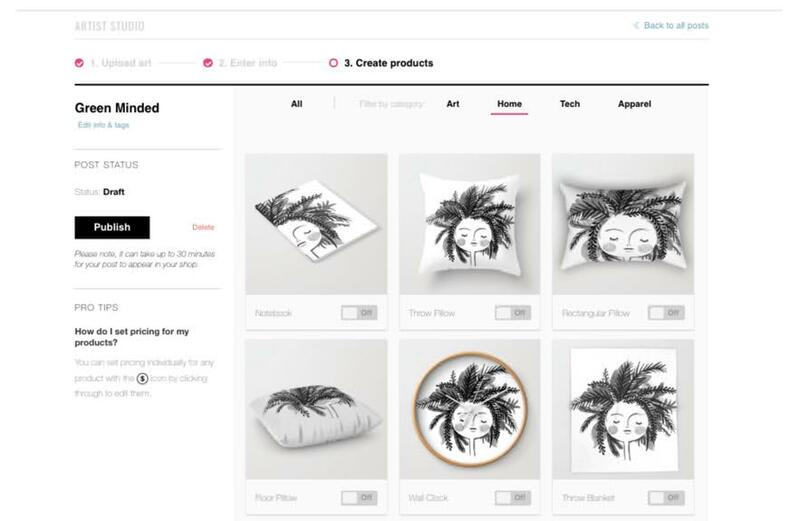 Once you are signed up and verified, Society6 lets you set up shop immediately. You start by uploading one artwork at a time, by dragging and dropping any image into their platform. Once uploaded, you will be asked to add a title to your work, a brief description (optional) and some tags to help make your work more visible. You can click on each one to edit the size and placement—if you’re a perfectionist like me—or you can leave the automatic image generated as is. You can also select which items you want your work on (if, for example, you don’t fancy your drawings on a floor mat!) For apparel, you get to pick from their broad spectrum of available colors. Society6 is transparent with its pricing. All prints come at a base price where you have the liberty to mark up and set your profits. For the rest of the items, they have a detailed list of the profits you will make upon sale of each product. When you look at the chart copied below, you may think that the potential profits don’t look so great. But think of it this way – if you have a photo or drawing just sitting on your computer, imagine being able to make a few dollars out of it without having to spend time and headache on production and shipping costs! 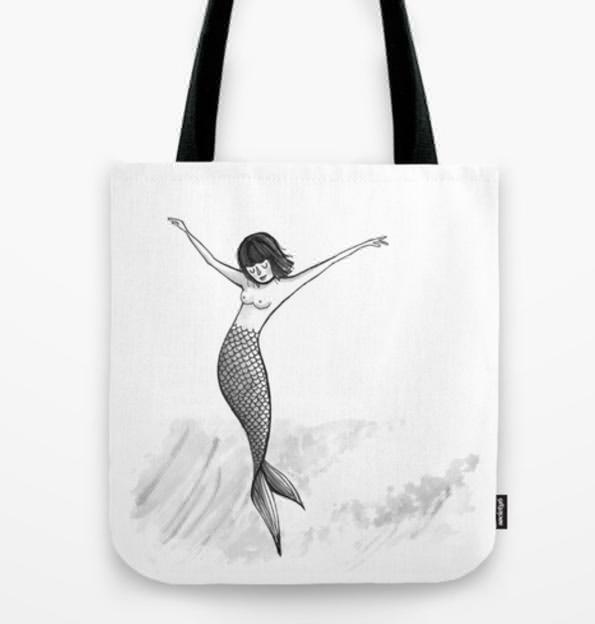 Society6 is great for passive income. Without disclosing exactly how much I’ve earned, I’m happy to say that getting notifications of sales has been quite delightful and has afforded me a “treat yourself day” every so often. As an artist, having an online shop also serves as a great portfolio of my work. When you show people a shark drawing in a gallery-sized frame or sleek-looking clock it can make the work look more impressive. Maybe that adorable photo of your cat will too? 1. You control the rights to your work; The image remains yours. It doesn’t matter if you’ve posted or published it anywhere else. You are also free to pull it out anytime or sell it somewhere else. 2. The quality of products is really good. I ordered a tote bag from my own work and was happy with how the printing turned out. The material is sturdy and it came wrapped in sufficient and professional packaging. For a tote bag featuring an image I love, it was a bargain at $15! This is the actual bag – true to its description! 3. Society6 make getting paid easy; You can easily track your earnings through the site. They list pending orders, and after a 30 day grace period, they are paid on the first business day of the month, straight into your PayPal account. 4. Society6 have regular FREE shipping offers. Like most other POD sites, Society6 charge customers a shipping fee BUT they regularly have free shipping days (on average once a month), which my clients love. I simply make an announcement on my social media channels when it’s free shipping worldwide so they can take advantage. 1. Uploading items can be tedious – IF you’re a perfectionist like me. 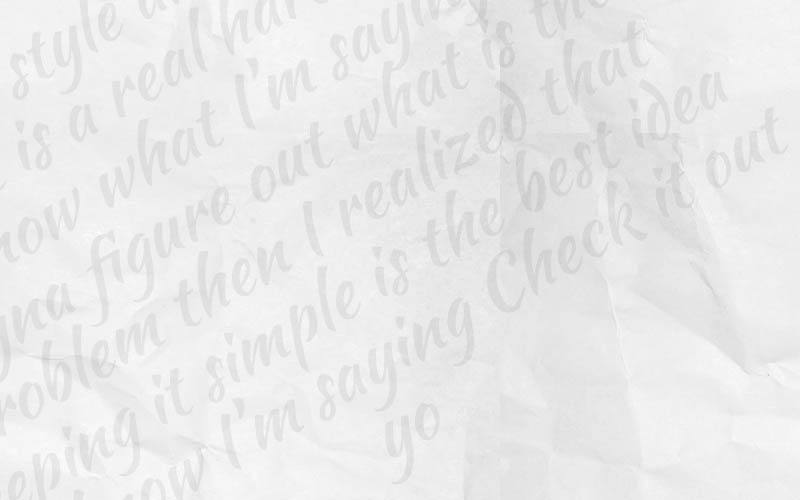 I personally struggled with adjusting and repositioning my artwork on the items. A big factor may also be that I am just impatient (they warn you that it may take a few seconds for the adjusted image to reflect on your screen). However, adjusting each and every image to my liking when they have over 30 items sometimes feels like a chore. 2. I’ve experienced ONE shipping blunder. A friend didn’t receive her order in time and filed a complaint with customer care. I followed up with her complaint as well. A few days later she received her order which was delayed by some unknown circumstances in Manila. A couple of days later, she received her replacement item for free. She actually ended up with two totes and was doubly happy! It can feel overwhelming at first; Take it one design/artwork at a time. Don’t worry too much about descriptions and tags because you can always go back and edit these later on. Be sure to do your part in sharing your shop’s page with family and friends. Update them when you have a freshly-uploaded artwork. Stay updated with the Society6 blog to get additional tips on how to make the most out of your shop or earn through commissions from other artists. That clever and funny line you came up with or that pretty flower you drew on your desk could easily be made into cute tanks or tumblers. They could be adding a few hundred dollars into your bank account right now. 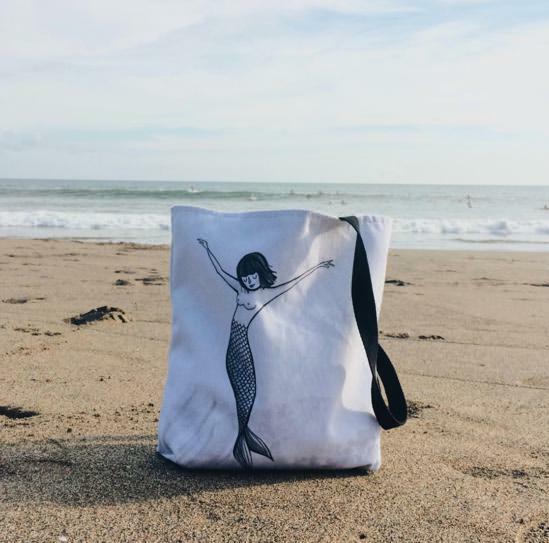 Society6 makes a great business or side gig – and it’s enjoyable too. If this Society6 review has inspired you, you can sign up to Society6 here. You’ll find my own store here! 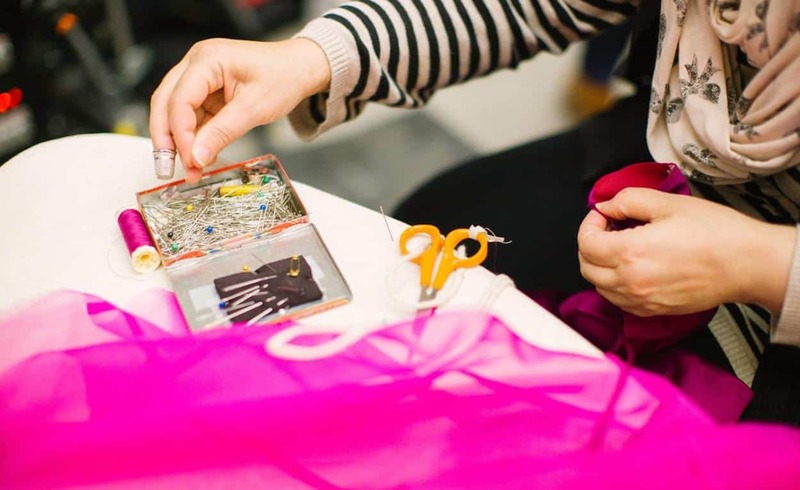 WANT MORE INSPIRATION FOR CRAFTY WORK FROM HOME JOBS? Don’t forget to sign up below for a constant flow of new ideas! Whether you want a side-gig or a platform for a new fashion empire - Society6 is a great place to start. 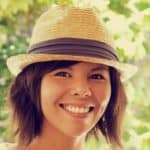 Previous ArticleUserTesting Review: Make Money User Testing Apps and Websites? 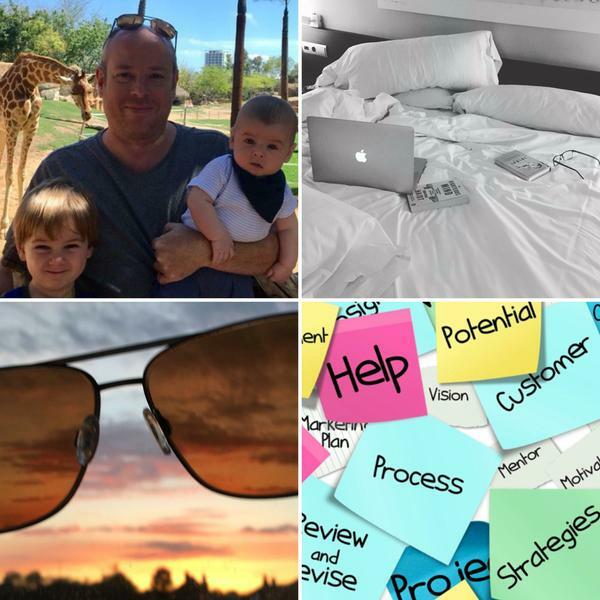 Next Article Working from Home: Are YOU Cut out for it?